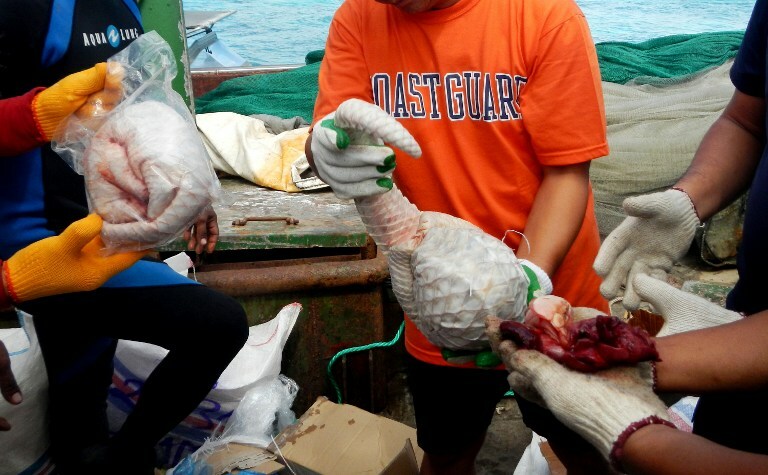 Philippine coast guard personnel inspect pangolins found in the hold of a Chinese boat off Palawan island, April 13, 2013. A dozen Chinese nationals are facing charges for poaching endangered wildlife after their boat, which ran aground on a protected coral reef in the southwestern Philippines, was found to contain hundreds of frozen pangolin carcasses in its hold. Wildlife officials in the Philippines are trying to determine whether the 10,000 kilograms (22,000 pounds) of pangolin—or scaly anteater—meat seized from the Chinese fishing vessel comes from a local species, according to Therese Mundita Lim, director of the Protected Areas and Wildlife Bureau. The Philippine Daily Inquirer reported Lim as expressing surprise over the large consignment of pangolin, which were already scaled and skinned. “That’s a big number. Even if these pangolins were not Philippine species, it doesn’t matter because pangolins are considered threatened species, and they are still liable for violations under CITES (Convention on the International Trade in Endangered Species of Wild Fauna and Flora),” she said. Some 400 boxes, each of which contain five to six pangolins, were discovered aboard the F/N Min Long Yu, which ran aground on the Tubbataha Reefs on April 8. The Philippine Star also quoted Lim as saying that its crew will face charges of poaching in addition to damaging the coral reef and other violations related to illegal entry and attempted bribery. The fishermen face up to 12 years' imprisonment and fines of up to U.S. $300,000 for the poaching charge alone. For possession of the pangolin meat, they can also be imprisoned up to six years and fined. Pangolins are in great demand in China because their meat is considered a delicacy, while some Chinese believe the animal’s scales have medicinal qualities. Lim said she will try to determine if the “dressed or rolled-up” carcasses were those of Philippine pangolin, a species endemic to Palawan province, where the boat ran aground. “We will try to identify them based on their exterior, that is, if it’s still possible in their condition,” she told the Inquirer. Lim said that pangolins are particularly susceptible to poaching by humans because “they are very shy and curl up in a ball when they are in danger,” making it easy for people to just pick them up in the wild. Eight species of pangolin exist across Asia and Africa, according to the World Wildlife Fund (WWF), and all are threatened by habitat loss and illegal trade for their meat and unique keratin scales, which can fetch hundreds of dollars per kilogram in China on the traditional medicine market. Of the four Asian pangolin species, the International Union of Conservation of Nature lists the Sunda, or Malayan, pangolin, and the Chinese pangolin as endangered. Two others, including the Philippine pangolin, are classified as near threatened. The animals are protected in many Asian nations, and an international ban on their trade has been in effect since 2002, but illicit trade continues. Reports have put the cargo of pangolins on the Chinese vessel to be worth around 8.4 million Philippine pesos (U.S. $203,200). “It is bad enough that these Chinese have illegally entered our seas, navigated without boat papers, and crashed recklessly into a national marine park and World Heritage Site,” WWF-Philippines Vice-chair and CEO Jose Ma. Lorenzo Tan said in a statement. Observers have suggested that the Chinese fishermen did not act alone in poaching and processing the pangolins. Philippine Coast Guard Palawan District commander Commodore Enrico Efren Evangelista told the Philippine Star that authorities are investigating how a the land-based pangolin ended up on board the Chinese ship. “This is one of the things that we need to find out, because the anteaters that we found on board the ship were already processed,” he said. WWF-Philippines said that the trade in illegal wildlife now comprises the fourth largest illegal global trade after narcotics, counterfeiting of products and currency, and human trafficking. The trade is estimated to yield at least U.S. $19 billion per year and draws poachers because of the low risk involved compared with other crimes, the WWF said, adding that there are presently no effective deterrents to the trade. Pangolins are among the most commonly encountered mammals in Asia’s wildlife trade, it said, with sizable numbers seized throughout East and Southeast Asia in recent years.